Google Wallet is a mobile app that would allow an NFC enabled phone to pay partner merchants. This article will tell you about Google Wallet. Google has just launched two of its much talked-about services, Google Wallet and Google Offers. Google had been working on Near Field Communication technology for Android Phones for quite sometime and just moments back, it unveiled a path breaking service to everyone at their NY city HQ. Google Wallet is a mobile app that would allow an NFC enabled phone to pay partner merchants via mobile phone. It’s like using a mobile phone as a wallet or a credit card for making payments. Google Wallet stores virtual versions of your existing plastic cards on your phone, along with your coupons, loyalty and gift cards. Whenever you come across a merchant that accepts ‘Google Wallet’ (currently PayPass by Citi MasterCard only), you will simply need to tap your phone with the contactless reader and the payment will be completed. No swiping of cards required at all. Google Wallet is meant to avoid carrying number of credit cards with you or avoid carrying the leather wallet altogether(in the long run). Google Wallet also provides multi-layers of security that keeps sensitive things secure and shielded. The best thing that Google Wallet brings to the table is that it auto-syncs Wallet with Google Offers, another service launched by Google today that will bring discount offers, local deals from partner merchants and plenty of other stuff that will help save money for consumers without having to bother about carrying discount coupons all the time. In simple words, Google Wallet is aimed to make paying fast, easy and secure, without the hassle of carrying along plastic cards. 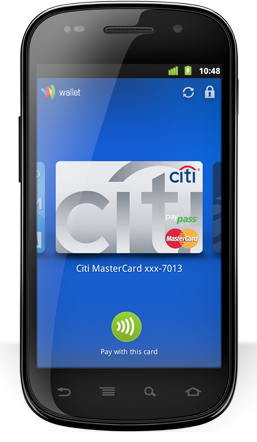 Google Wallet has currently partnered with Citi, MasterCard, First Data and Sprint to get Google Wallet up and running. Currently, Google Wallet service is enabled for Nexus 4G phones by Sprint. Although Google has made the announcement, the service isn’t immediately available for actual consumer use as it will run under test phase for sometime now. As Google states in its vision statement, Google sees NFC technology going far beyond just payments. The idea of making payments through mobile wallets is just a tip of the iceberg. NFC is a huge technological innovation and Google sees it as a stepping stone to the future of unified digital carriage of things that are currently carried on paper. Going by Google’s vision, boarding passes, tokens, tickets, bills, coupons, receipts etc, everything will become digital and will exist right within the mobile phone. In future, Smartphones will become the All-what-you-need device and you will simply have to carry along your mobile phone and nothing else. But NFC technology is still in its nascent stages so there’s still a long way to go but the whole idea is very much believable, rather inevitable so full marks to Google for being the first to offer such service. Apple is also rumored to be preparing its own payment service and it seems, even Microsoft will be coming up with its own mobile payment service for WP7 phones. Google will be looking forward to positioning Google Wallet as an open commerce solution supported by all Smartphone ecosystems but will be succeed in its ambitious goal is something that remains to be seen.